Hello, my name is Peter Rowe, and I am “The Handsome Man”. 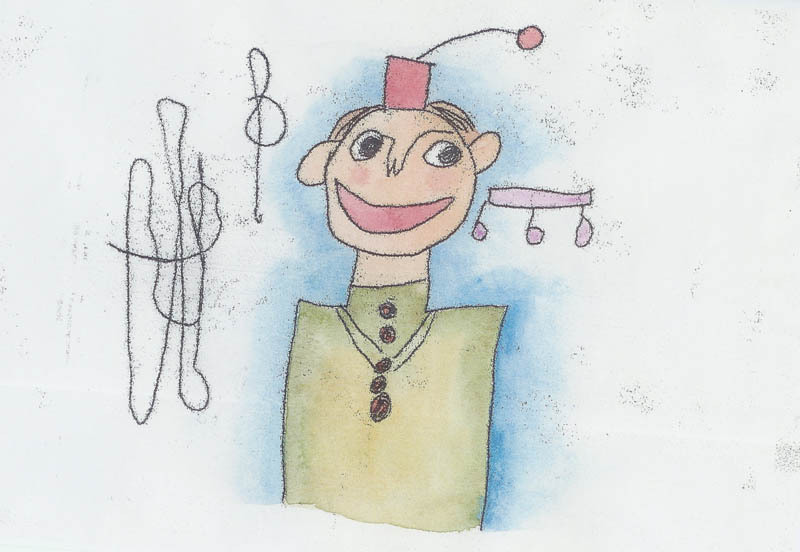 Over the years I have also become an artist, a writer, a performer and a public speaker. But it has taken a lot of time, effort, and support to get there. 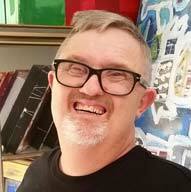 I was born with Down syndrome and other disabilities that restrict my ability to articulate speech. I grew up on a large sheep farm on the New England tablelands in Northern NSW with my parents, Justin and Betty, and five siblings: Maryanne, Elizabeth, Pauline, Gretta and Justin Jnr. I am the youngest. Although I couldn’t speak, and they had been told I was intellectually disabled, my family loved and accepted me, and always included me in whatever was going on. But that wasn’t true: I could solve problems and make decisions, and I was able to remember and understand everything that was said to me, but I just couldn’t let anybody know that. I was never intellectually impaired – in fact I have since been tested and have the IQ of an average able-bodied male of my age. I was only unable to speak and unfortunately that causes some to treat people like me as if we have no understanding or comprehension. … being in a body that makes people sometimes think you’re dumb; a body that doesn’t let you speak; a body that gives people certain opinions about the personality you should have, or what you can and can’t do. Imagine … what it would be like to close your mouth and tie it shut so you cannot reply to insults or other things that people say to you…. It is the most awful thing to have to absorb what everyone says to you and not be able to reply or defend yourself. How did you develop your capacity to communicate? Even though I cannot read, write, or speak, I do understand language. I have been listening to language for many years. People like me who can’t speak, we were born thinking and reasoning people, and we picked up language in our heads much the same way you all did. Language is with me always; I just can’t speak it. As far as spelling and sentence structure, that is learnt in a lot of different ways. I learnt to spell watching Sesame Street as a child, but I don’t know how. It is very complex and even I don’t understand it. I learned writing at Armidale Special School when I went there. I also learned a lot from watching my siblings doing their homework; I watched them writing words down and I tried to write too, but I interrupted their homework and was taken away. So I used to copy words and letters from books over and over for hours, trying to teach myself. I used to get whole words in my head, but I didn’t know what the letters looked like until Sesame Street and Armidale. There are words, even big words, that I just know. I can’t even read, but somehow I know them … the words are just there, in my head, and I know where to use them and where not to. Fortunately for me, back in 1987 I was introduced to a system called Facilitated Communication, or “FC”. Facilitated Communication changed my life forever, in ways I could not even imagine. Facilitated Communication” (FC) allows me to tap out my words, letter by letter, on a QWERTY communication board, with the help of a trained facilitator, who reads and speaks out my words. Caption: Fortunately I am a very good speller! After I had my first assessment and FC lesson with Jane Remington-Gurney, I cried all the way home with relief that I could talk to someone at last and get my thoughts out. I was about 30 years old. I can still remember how it felt to talk to Jane and to hear that she understood what I was saying. I was so excited by the prospect that I was talking. My mum cried a lot too when she discovered, through FC, all the things I had never been able to tell her, both good and bad. And we both cried when I was able to tell her for the first time that I loved her. It has increased my self-confidence, and it has enabled me to meet and work with some amazing people. Working with performance poet ‘Ghostboy’ at a Brotherhood event. With Jessica Watson on a panel discussion about overcoming adversity. FC allows me to write, perform, give public presentations, work with my art teachers and live a full and meaningful life. I now love my life! It is only since learning FC and being able to let others know my thoughts through typing that I have felt truly connected with my community. That is why INCLUSION is such an important theme for my books – because until I could communicate through FC, I was excluded from everything (not by my family, of course). I understood everything that was going on around me; I just could not contribute. Before I learned to communicate through FC people talked about me in front of me and it made me so sad that I could not correct their perceptions of me. I could do nothing but listen and weep inside because of my frustration. Even though I cannot speak, I CAN COMMUNICATE! I am included in conversations and my opinion is sought and respected. I am now a complete person. Inclusion is important because now people know who I am, what I can do and what it means to have a voice. I know that there are many people like me who cannot speak who are still excluded. So inclusion allows me to advocate for those people and hopefully help them to find a way to communicate. 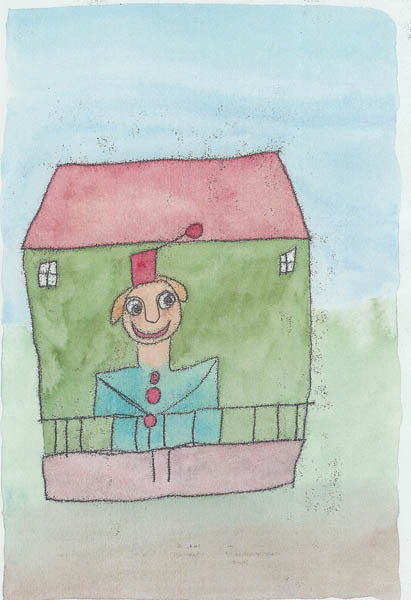 How did you start writing and illustrating children’s books? Ever since I was young I have had stories running through my head. But because I could not speak or write to get them out I just had to think them and then let them go. The stories were always there, and once I finally learned to communicate through FC, they just came rolling out. That is why learning to speak through FC is such an amazing miracle I am so grateful for. It has allowed me to get the stories out of my head, onto paper and out there. 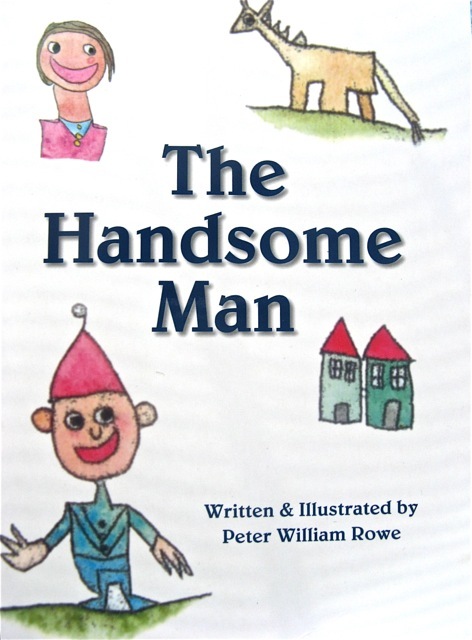 “The Handsome Man” was one of my first books. It’s about me, of course. It came when I was with my speech therapist, Jane Remington-Gurney. The “Josh the Robot” character represents me too: he is very kind, and he is forgiving of people who do not accept him. Josh is a Robot who is different, but as he receives acceptance from his new friends, he gains the strength to speak out and influence others. The Josh stories are a representation of my life. 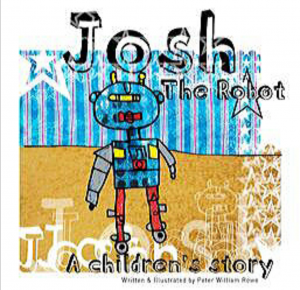 I have written and illustrated seven children’s books so far, including the four Josh the Robot books. But I have had some great support workers (like Ryan, Natalie and Nicky) who helped me write the stories and draw the illustrations for those books. Then other people like Mitch and Marcia helped to get the books ready for the printer and get them printed and out there. Marcia coordinates all of this, including corrections, proofs and liaising with the printer to get a barcode /ISBN number and to organise the printing. 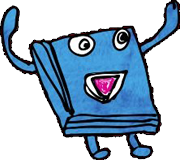 I’m currently working on a fifth Josh book – Josh Goes to the Library. It will help teach children about how to behave (or not behave) in a library. It is nearly ready for the printer. I have also been writing regularly since 1995 with a group of other people with various disabilities who are without speech. We call ourselves “The Brotherhood of the Wordless”. There are about 12 of us who write regularly with the help of Facilitated Communication. We have had our writings published and performed at the Queensland State Library, the Brisbane Poetry Festival, Woodford Folk Festival and the Brisbane Writer’s Festival. We also wrote and performed in our own Cabaret, with the help of our facilitators, family members and carers. We could not do any of this without them – and they do it out of love and their belief in us and our abilities. What does your writing mean to you? How does it help you? My writing means everything to me. Writing helps me to get thoughts out of my head and it means I can tell people my own story. I love writing children’s books because I can pass on to children messages and lessons that might help them in their life’s journey. Children learn at a young age and I love to teach them. I love being able to show young people what is possible – for all of us …when we are given the opportunities and help we need. with the exception of Mum and Dad! My writing, and my art, allow me to express those things that are dear to me behind the curtain of my disability. They have given me another way to communicate my feelings and share my thoughts, dreams and experiences. It gives hope to me that I can get across a message to an audience that may not have expected a lot from me. Doing my art, having exhibitions, getting my books published, and my performing and public speaking – all these things have been an important part of my journey and have helped me to become who I am. They have also helped me overcome Post Traumatic Stress from a very abusive situation in my past. They have given me more confidence, boosted my self-esteem and allowed me to meet and work with lots of different, amazing people. Talking to the Minister for Disabilities, Tracy Davis, at my exhibition in Cup From Above café, in Aspley, Brisbane. With the Mayor of Ipswich, Paul Pisasale, at a Business disAbility Awards Breakfast at Toowoomba last year, where we were both guest speakers. It has also opened up opportunities for me to speak to others about disability and Facilitated Communication. And all my activities have enabled me to get my message out about the talent and ability of people who are labeled ‘disabled’, where in point of fact they should be labeled ‘differently abled’ (not disabled). We are just like you, with our own hopes and dreams and the need to be useful where we can. … and to show the wider ‘non-disabled’ community that people with a disability can contribute in so many valuable ways to the greater good of all humanity.